One day, after a couple glasses of wine, I decided that I wanted to come up with a recipe that combined my favorite flavors into a single Deerslayer-worthy dish. 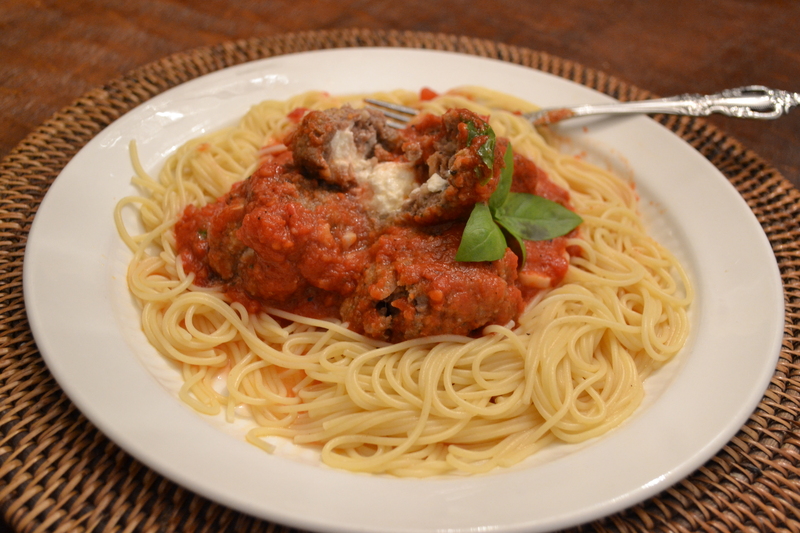 Pasta with a delicious sauce full of bright, fresh flavor, and venison meatballs. Not just plain ol’ venison meatballs, though. Something spectacular, with a surprising burst of flavor! Sounds almost scary, don’t it? I was drinking, don’t forget! 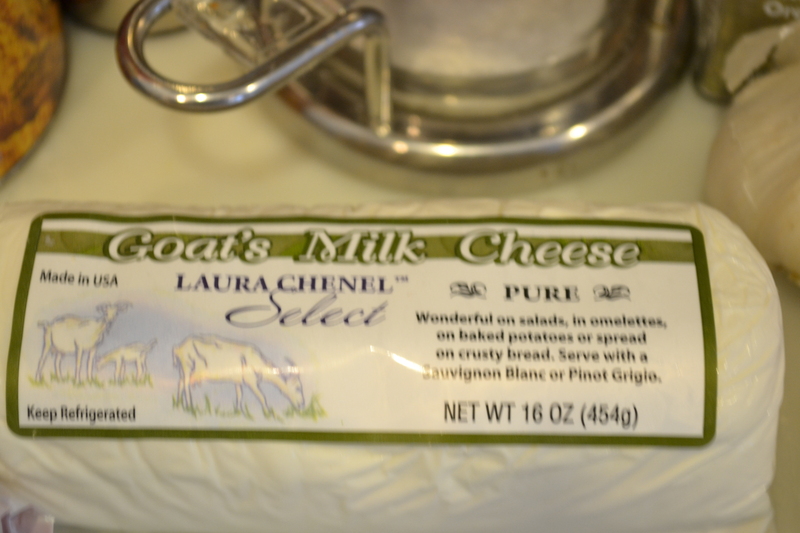 In a sudden brainstorm, it occured to me that goat cheese would make a perfect filling. Yup. I pulled ingredients from all over the kitchen, raced to the freezer for ground venison, and snipped herbs from the garden. The results were pleasing, worth sharing. Worth preparing again… and again. Just typing it up makes my mouth water. I hope you like it, too. 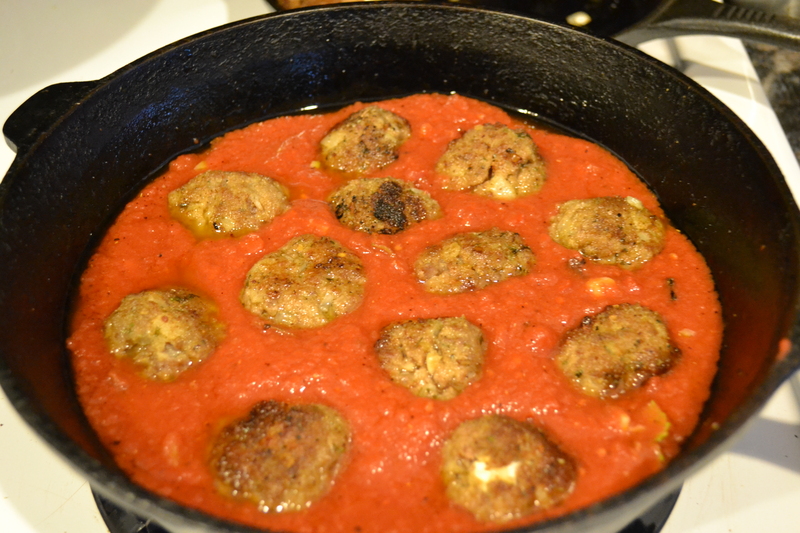 Because the meatballs are the star of this show, I wanted the sauce to be simple with a clean taste. In a cast iron skillet, saute garlic in some olive oil. Add tomatoes and oregano. Add salt and pepper to taste. Add basil at the end as a garnish. Simmer while you work on the meatballs. 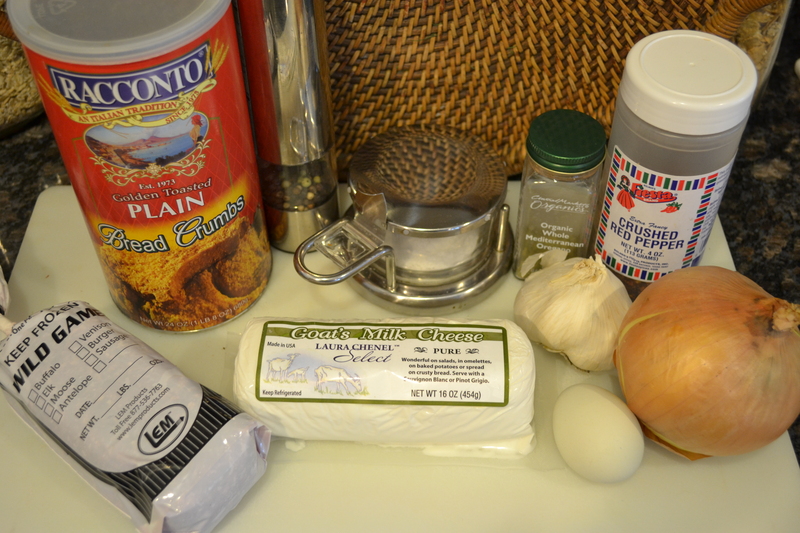 In a large bowl, thoroughly mix venison, 1/2 cup of breadcrumbs, and remaining ingredients except goat cheese. 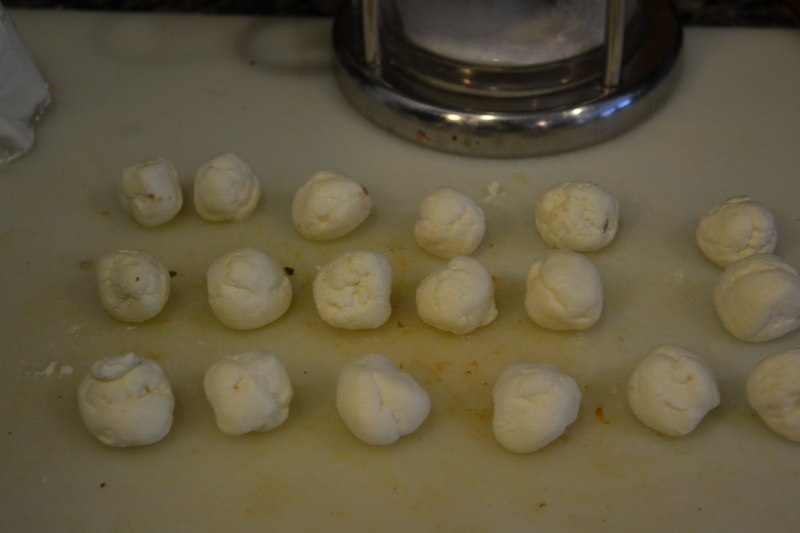 Use a teaspoon or cute scoopy thing to make small spherical shapes from the goat cheese. Or balls, if you must. 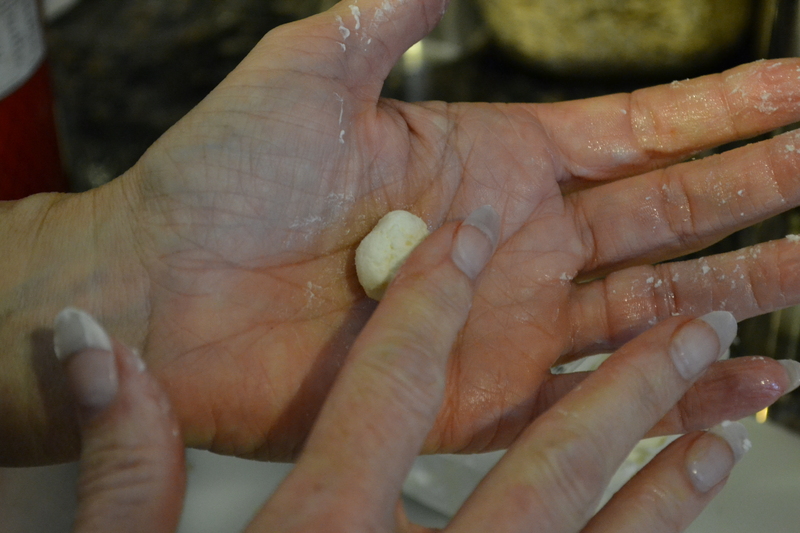 A small amount of olive oil rubbed on your hands will allow you to rather easily roll the goat cheese into cute little balls. Go ahead and make up several so that you don’t have to mess with it later. 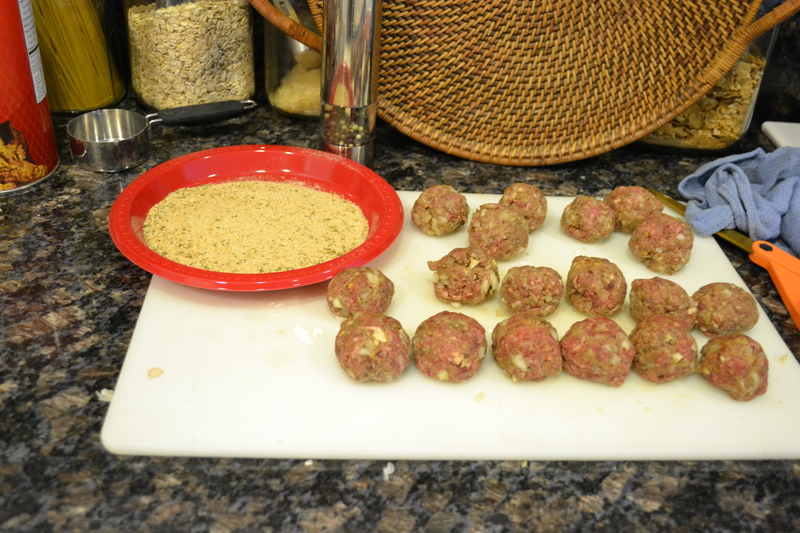 Now you’re ready to begin making the meatballs. 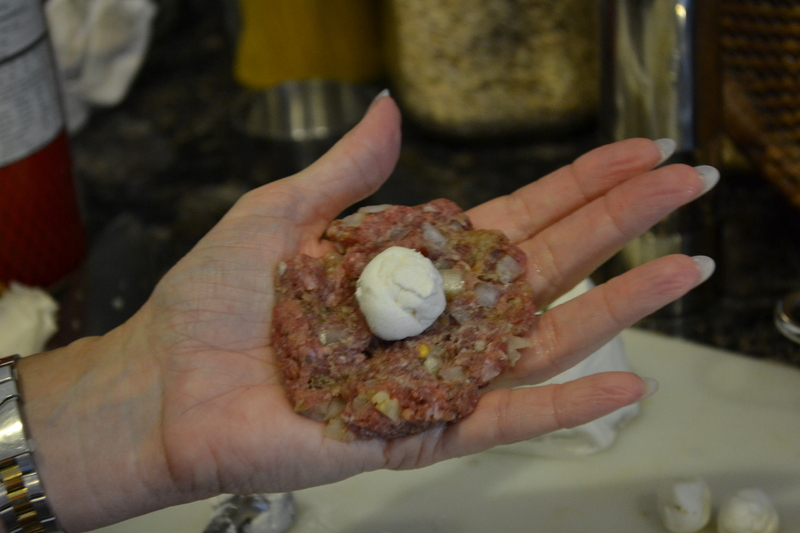 Take a small amount of the meatball mixture, about the size of a lemon, and flatten it into the palm of your hand. 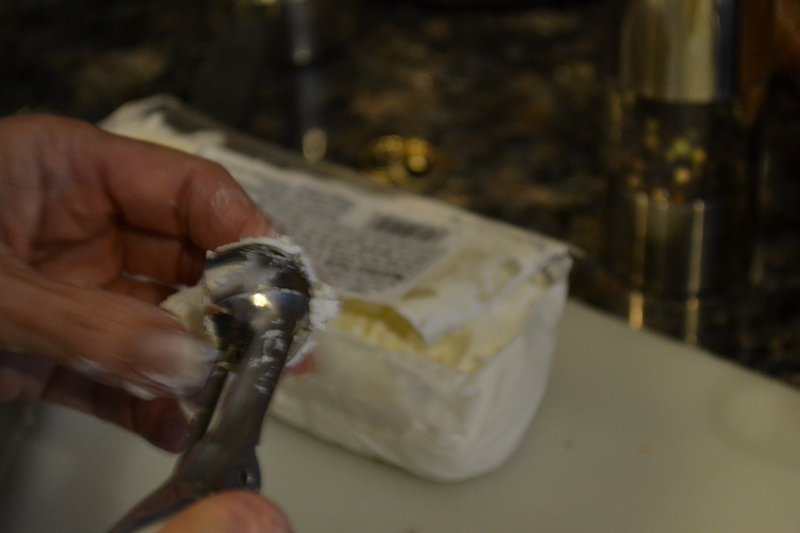 Place a ball of goat cheese into the center so that the meat can be brought around to completely cover the cheese. Continue until all the meat mixture has been used up. Pour remaining 1/2 cup of breadcrumbs into a small dish. 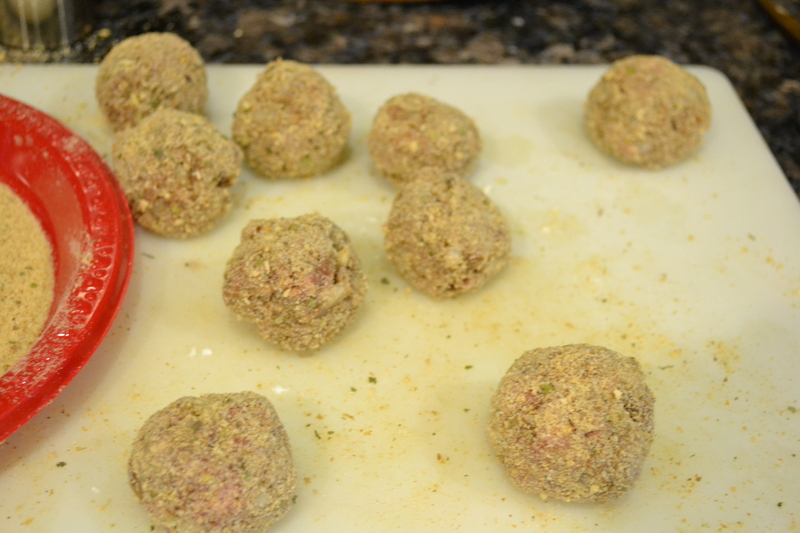 Roll each meatball around in the breadcrumb mixture to cover. 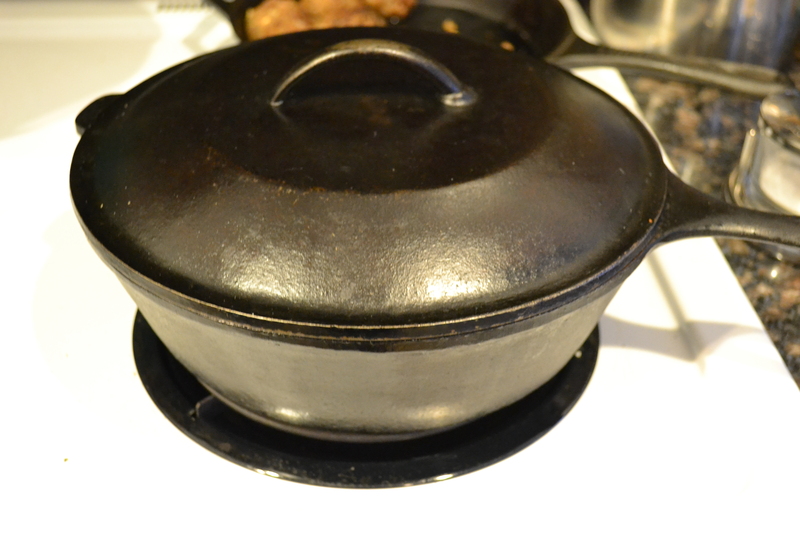 Place enough olive oil into a deep cast iron skillet or dutch oven to cover the bottom of the skillet. Heat to medium high heat. 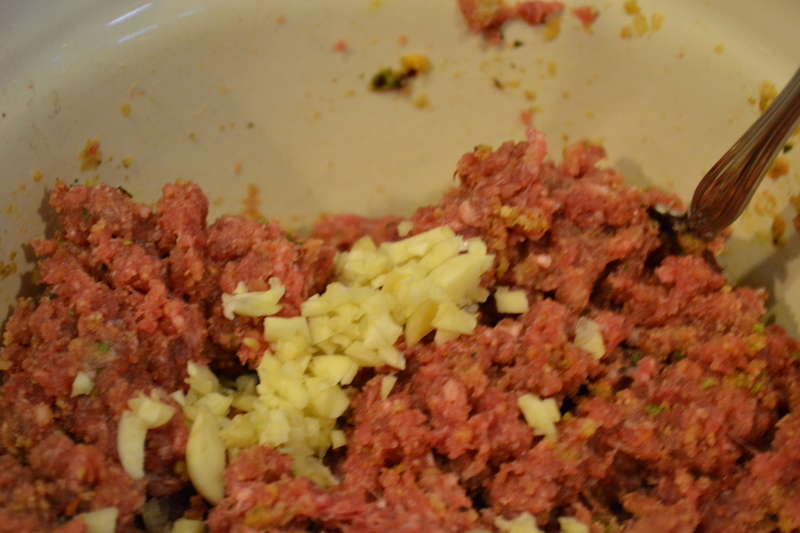 Add meatballs, a few at a time, to the skillet and brown on all sides. 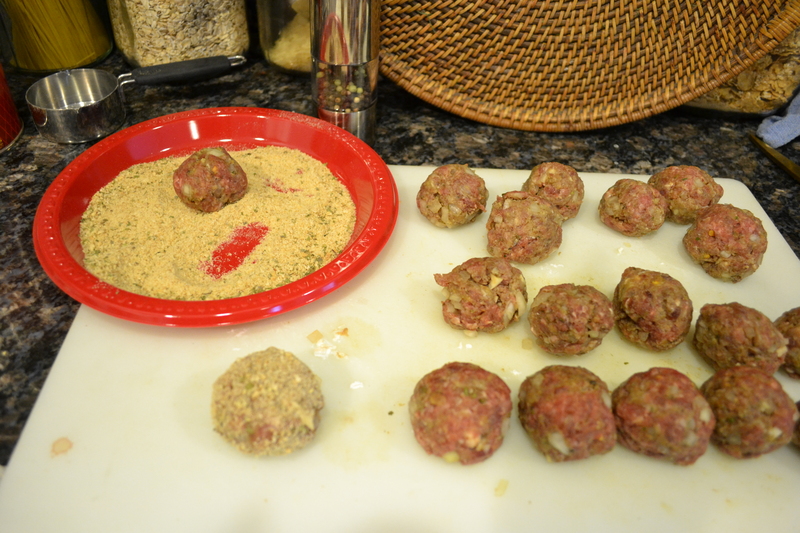 Remove to another plate until all meatballs have been browned. 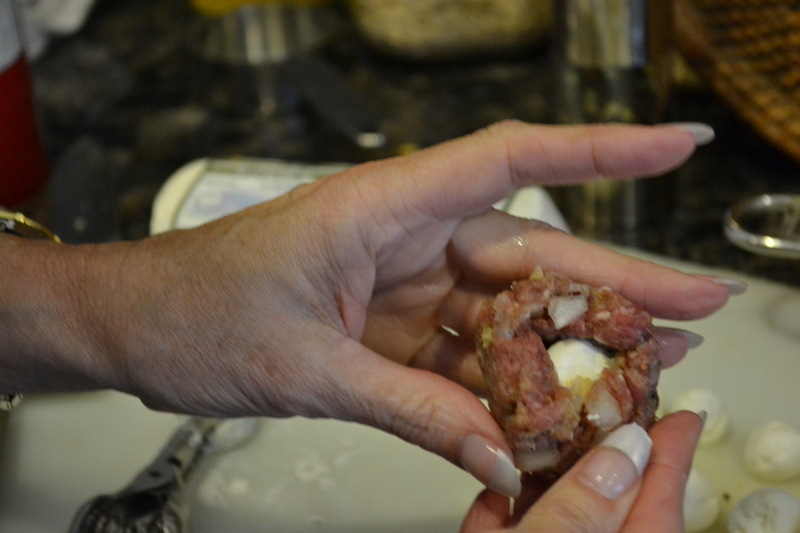 Very carefully, so as not to break them open, roll the meatballs around until all sides are browned. 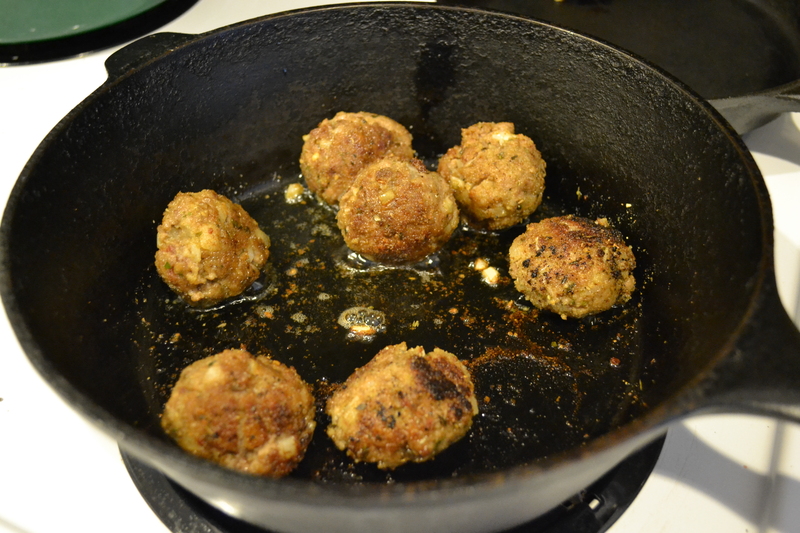 To the original deep-sided skillet or dutch oven full of sauce, add as many meatballs as will fit. Leftover meatballs can be frozen for later use. 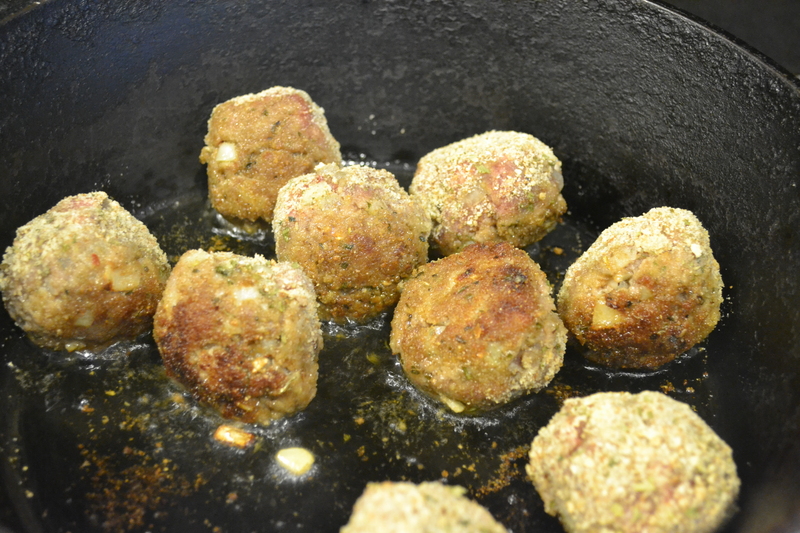 Using a spoon, cover meatballs with sauce. 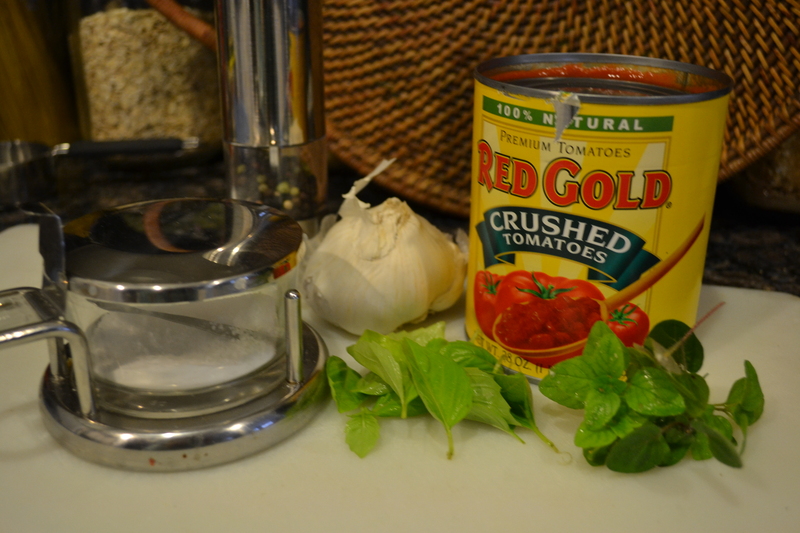 Water, tomato sauce or broth can be added to produce extra volume. Simmer for 20 minutes. 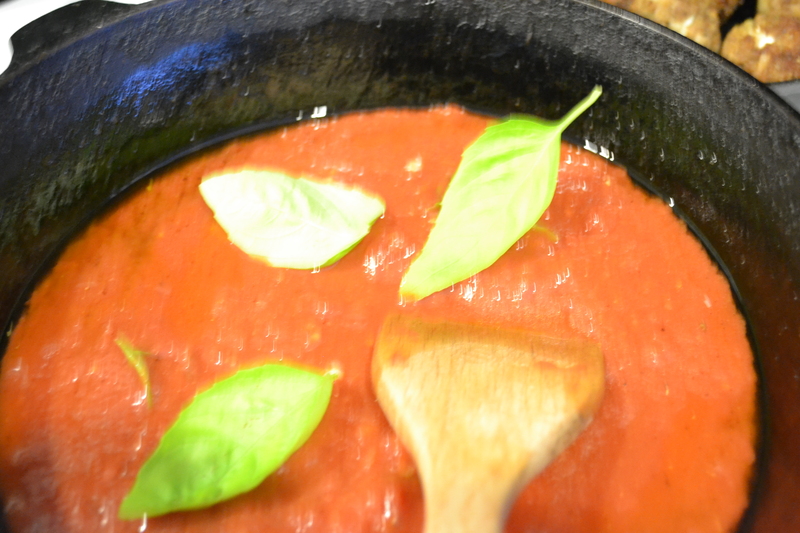 Serve over the pasta of your choice with some fresh basil. Hope you love it. Let me know. 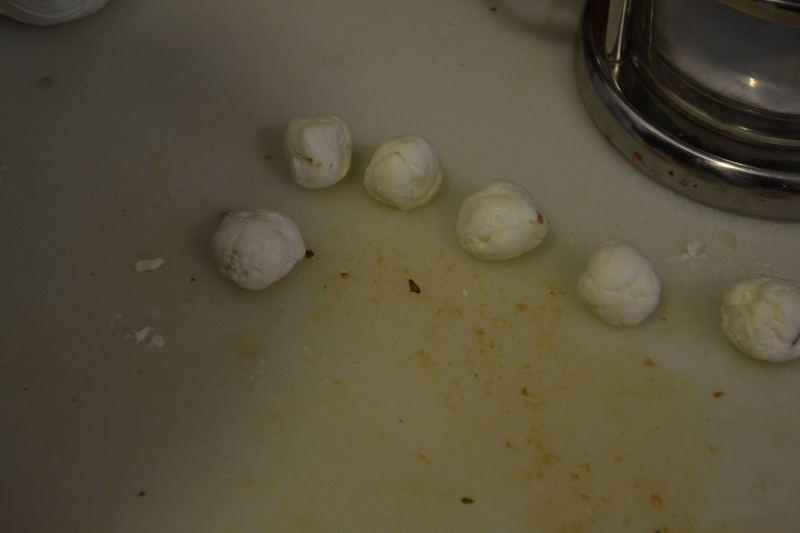 You just gave me a great idea on what to do with a bunch of little mozzarella balls I found the other day! Fabulous idea! You can’t go wrong with good cheese and venison and pasta! The possibilities are endless! Yay for multi-taskers. I’m thrilled that you liked the recipe. Thanks for checking out my site. 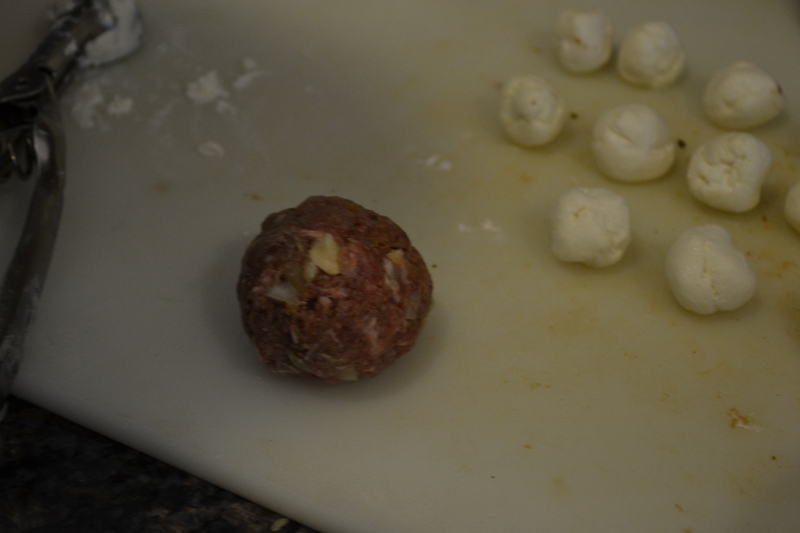 I love the way you hide that round ball of goat cheese inside the meatballs. I can imagine myself taking a bite, and suddenly wondering what else comes in it. The photo is awesome. I wish I could crash through the screen and taste. I am sure it tasted extra delicious. Thanks for sharing.